Bed was too soft for my personal liking, lacked support. Bathroom light is dim, harder for us gals to apply makeup. But other than that, the hotel was very nice and clean and up to my expectations. Thank you! Great staff, great location, good beds and good price. Business trip. Front office staff friendly & helpful. Good people. Rooms large & clean. Starting to show some age, but overall a very good place to stay on business. No good eateries close by but betting that will change when the street car extension work is done. The front desk manager was excellent and felt me feel appreciated as a customer. Enjoyed our stay but wasnt impressed with the evening guy on duty at the front desk--He was pretty challenging & rude. The room was really comfortable & clean though & the rest of the staff was very kind so we would definitely recommend it to others. The hotel was overall nice the staff was courteous, but the hotel was in a bad part of town. Could not know that from the website. For that reason we will not be staying there again. The check in was fast. The room was clean and the entire location was clean. Facility has seen better days. Carpet dirty and scuffs on walls. Overall dingy look. lighting in bathroom terrible. Won't be back. Small lobby/breakfast area but everything was immaculate. Free breakfast was as expected and perfectly suitable. Rooms and bathroom were clean and tidy; having the secondary "suite" living area was excellent. Quiet, even though we were right next to the elevator. Friendly, cheerful staff! Location is not fabulous but given everything else was great we had no complaints. Great. Nice place close to where we needed to be. Very friendly and helpful staff. Room was clean, staff friendly, breakfast okay, nothing special. Near rail, but it didn't bother us. Good value for price. Baymont by Wyndham Mesa Near Downtown places you within a mile (2 km) of popular attractions like Mesa Arts Center and Mesa Convention Center. This 48-room hotel has free breakfast along with conveniences like an outdoor pool and free in-room WiFi. Start your day off right with a free hot/cold buffet breakfast, served each morning from 6 AM to 9 AM. Guests can expect to find free WiFi and 37-inch a flat-screen TV with cable channels. The pillowtop bed provides a full night's sleep and the bathroom offers hair dryers. Other standard amenities include a refrigerator, a microwave, and a coffee maker. 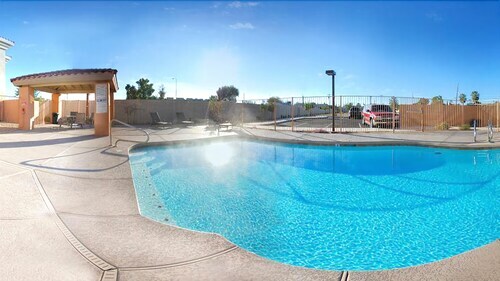 Baymont by Wyndham Mesa Near Downtown offers an outdoor pool, a spa tub, and free WiFi in public areas. You can put free parking to good use if you drive. The 24-hour front desk has multilingual staff ready to assist with sightseeing, directions, and local dining recommendations. Additional amenities include a 24-hour business center, a computer station, and express check-in. We appreciate the time you have taken to give your feedback on your recent experience, especially with regards to our area and breakfast. Our goal is for every guest to have a convenient and accommodating experience so we thank you for sharing. We strive to give every guest an enjoyable and memorable experience. Thank you for the comments regarding our breakfast and staff. It is valuable to have this matter brought to our attention and we hope to see you again in the future. Thank you so much for the incredible rating. We look forward to your next visit! Your voice is so valuable to us in our continued efforts to provide every guest with an enjoyable experience. We appreciate you sharing your comments regarding our bed. Your voice is very valuable to us and we hope you will return on your next travels. We can't thank you enough for sharing your feedback with regards to our staff and price. Please do come see us again. It is such a compliment to receive such a wonderful rating. Thank you for taking the time to share about your experience with us and we hope to see you again very soon. It is really heartwarming to see such a wonderful rating. We truly appreciate you taking the time to rate your experience. We hope you will come back to see us again on your next trip to the area! It was our pleasure to provide you with such a wonderful experience. Please do come see us again very soon! Your voice is so valuable to us in our continued efforts to provide every guest with an enjoyable experience. We appreciate you sharing your comments regarding our staff. We greatly appreciate the time you've taken to rate our hotel and we look forward to your next visit. Your voice is so valuable to us in our continued efforts to provide every guest with an enjoyable experience. We appreciate you sharing your comments regarding our front desk. We hope to someday have another opportunity to host your stay. Free hot/cold buffet breakfast is served daily from 6 AM to 9 AM. The preferred airport is Phoenix, AZ (PHX-Sky Harbor Intl.). The following credit cards are accepted: American Express, Diners Club, Discover, JCB International, Mastercard, and Visa. Only bookings from non-local guests are accepted. Guests whose residence is within 25 mi (40 km) of the property will not be allowed to check in.